The banana tree has often been described as a perfect example of being totally useful from root to fruit. (well, considering that the 'tree' is in reality a mutant, giant grass, the description begs for quite a bit of clarification). The banana 'plant grows from fat squat entities called corms which are the actual stems of the plant, the 'trunk' in reality is the base of the leaves which are tightly layered in concentric layers. In terms of its use, other than the fruit, the inflorescence (banana flower) is often used as a vegetable in Asian cuisine, the leaves are used for wrapping food for steaming, as disposable plates and the occasional umbrella. The fibers from the exterior part of the stems are used for textiles as well as yarn. The core (or the heart) used for cooking consists of the central, compressed part of the stem, the part which cannot be peeled off in layers. Its been used as a folk remedy for kidney stones and thanks to its fiber rich nature, its a great vegetable to add to your diet for weight control. (Its another story that the stems are rarely seen even in the ethnic grocery stores here in the US of A). The prepping process is not straight forward. The instant the stem is cut, it turns brown due to oxidation. For this purpose, the diced bits need to be immediately immersed in acidulated water ( for some reason, the medium of choice is water mixed with a ladle of diluted yogurt or buttermilk). When the stem is sliced into coins, the immature fibers that stretch out need to be removed. Don't get grossed out, these are not slimy like Okra or sticky like spider webs. They're more like strands of delicate cotton that are pretty strong enough to lift the slice of stem. The optimal way to extract them is to gently twist the fibers out of the stem, using your index finger and discard. The coins are then diced and added to the acidulated water, and left for about 1/2 an hour. 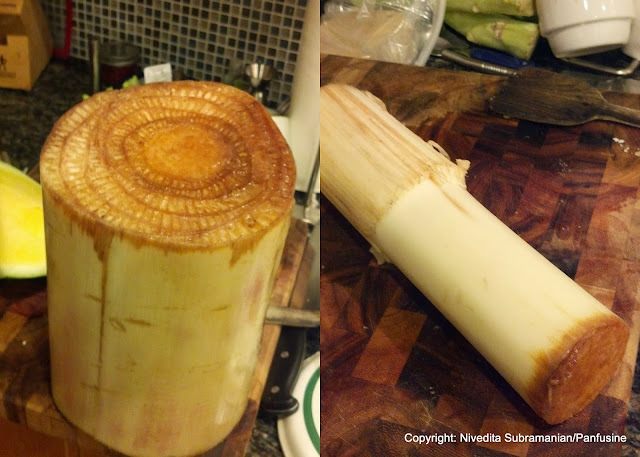 The banana stem by itself does not have a particular flavor, just a delicate vegetal, grassy aroma. This make it the perfect vehicle for adding your choice of spices as per your preference. The crunch of the vegetable even after cooking gives it a textural distinction that is rather delightful. Prep the banana stem as per the instructions listed above. Drain the yogurt/water mix and transfer the diced stems to a pot containing water with the turmeric added. bring to a boil and cook the stems for about 15 minutes until they're pleasantly crunchy to the bite. Drain the water and reserve the stems. Heat the olive oil in a wok and add the mustard seeds & the urad dal, just as the mustard begins to sputter add the broken arbol chiles and the torn curry leaves along with the asafetida. Toss in the cooked stems, stir to combine. Add the salt and stir fry on medium heat until any residual water has completely evaporated. Stir in the shredded coconut to evenly distribute it. and transfer to a serving dish. Drizzle with the coconut oil prior to serving. Serve warm with rice and traditional South Indian dishes such as Sambhar & kootu. My favorite vegetable. looks very yummy. Even I saw some in local Apna Bazar, but it looked so huge. Didn't know how it would be inside. I am sure gonna grab some next time and make some mor kootu. I do this way exactly but finely i drizzle with coconut oil which enhance the flavor so as taste ! This is a rare treat! It's been so long since I've eaten them. What a lovely prep tutorial and a great recipe. I like this dish so much. My mom prepare this very tasty. I would like to have this more. Thank you for this great post.